Founded in July of 2007, Guardian Pharmacy of Daytona serves residents in assisted living, skilled nursing, and other long-term care communities. Our goal is simple: We strive to earn your business every day by providing customized service that meets the needs of your community. With more than 30 years of combined long-term care experience, our management team is passionate about the industry and driven to accomplish this goal. As owners as well as operators of the pharmacy, our success is uniquely tied to the satisfaction of our customers. Equally enthusiastic, our pharmacists, certified pharmacy technicians, billing specialists, medical record specialists, nurse account managers, and licensed consultant pharmacists have proven expertise and are all dedicated individuals who care. Guardian Pharmacy of Daytona currently services customers from Volusia south to Brevard, west to Seminole, Lake and Marion counties and north to Flagler, St. Johns, Putnam, Alachua and Gilbert. With five additional locations across Florida, we provide statewide coverage to Florida’s long-term care communities. 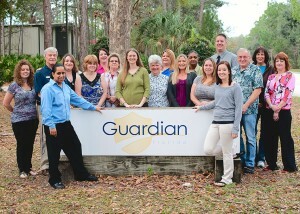 Locally owned and operated, Guardian Pharmacy of Daytona is also part of the larger Guardian Pharmacy Services family, which has a national support center located in Atlanta, GA. While our support center contributes significantly and strategically to our operational success, the decisions about how to best serve our markets are made locally to ensure quick decision making and flexibility to tailor service to the individual needs of our customers.